A new Gallup poll shows that Hillary Clinton has been named the most admired woman in America for 20 years in a row. That victory might be a little sweeter if the poll wasn’t pretty clearly based on name recognition alone: Americans also say they admire President Obama, Pope Francis, Donald Trump, and—sure, why not—Bernie Sanders. The poll, which we saw via The Hill, took the addled temperature of 824 proud Americans, with a margin of error of 4 percent. 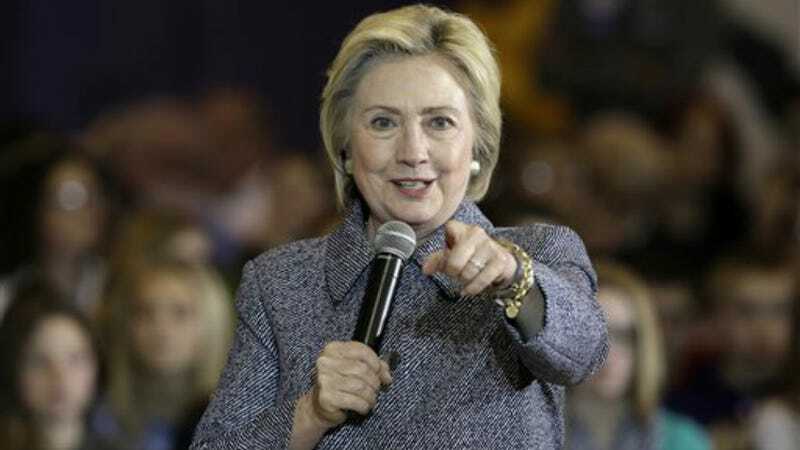 It found that 13 percent of them said they admired Clinton most of any woman “living anywhere in the world.” Trailing her in second place was education activist and assassination attempt-survivor Malala Yousafzai with five percent. Oprah and Michelle Obama each got four, while Carly Fiorina (? ), Angela Merkel, and Queen Elizabeth II got two percent. On the gentlemen’s side, Barack Obama won most admired man with 17 percent, while Pope Francis and Donald Trump were tied in second place with five percent each. Bernie Sanders got three percent, Bill Gates got two, and a nightmare garbage bag of other folks got one percent each: Ben Carson, the Dalai Lama, George W. Bush, Bill Clinton, and the mostly fossilized Reverend Billy Graham.